Ken joined the Hub City Curling Club in 1958 and was a member until it closed in 2007.He was elected to the Board of Directors in 1964 and served as Secretary, President and Treasurer over the next forty odd years. He was involved with many committees including, Chairman of the Bond Bonspiel for 15 years and organizing and chairing 1st Hub City Senior Spiel in1983. Ken was a representative from the Hub City CC in Curl Saskatoon starting in 1966. He served as President in 1970 and Sec-Treasurer from 1972 – 2000. He was in charge of running the draw and Bonspiel Headquarters for the Saskatoon Mens Open for more than 25 years. 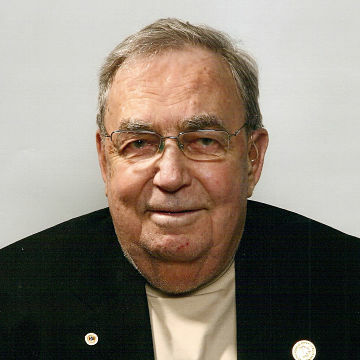 He was involved on various committees when Saskatoon hosted National Championships as well as many Northern and Provincial playdowns. When the ice went out in the spring Ken moved to the ball diamonds. In 1954 he was one of the original organizers of the Saskatoon Merchants fastball team. During the next 25 years he was a player, an assistant coach, head coach and a member of the executive. He also coached some minor league baseball and even did some umpiring. 1976 – Life Membership in the Hub City Curling Club. 1986 – Named Saskatoon Sportsman of the Year. 1988 – Elected as a Builder in Curling and Fastball to the Saskatoon Sports Hall of Fame. 2000 – Received the Scotty Richardson Award for outstanding support of curling in Sask. by the SCA.